Japanese architect Shigeru Ban has designed a retractable and refillable pen for Acme Studio that doubles as an architect's scale ruler. The three-sided Scale pen is made from aluminium, and features a laser-etched ruler on each of its three facet. As well as serving as a fully functional architect's scale, the design works as a ballpoint pen that retracts with a twist of the upper and lower half. 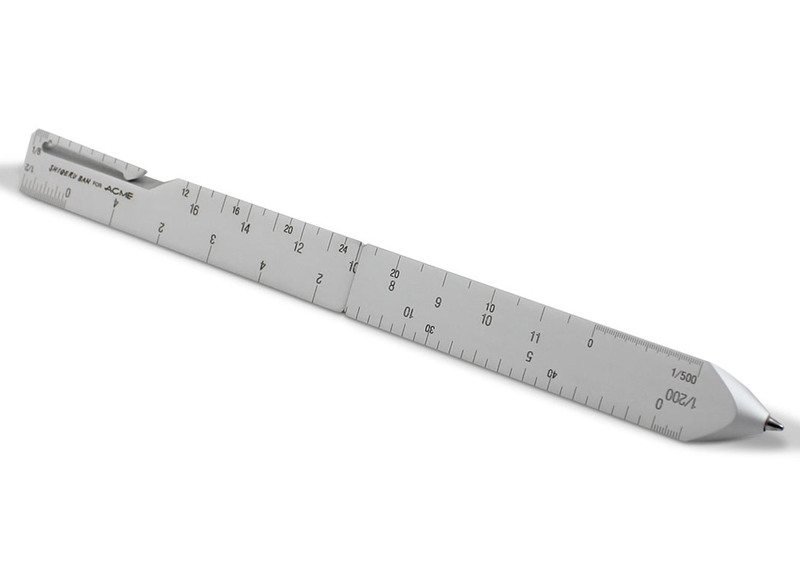 An architect's ruler – or scale ruler – is used to determine actual distances on a scaled drawing. The instruments typically feature multiple scales along its length, so architects can measure different drawings with the same ruler. To fit various scales onto one piece of equipment, designs are often tetrahedral – a feature that Ban replicated for his pen. The Scale pen currently retails on the Acme Studio store for $90 (approximately £64), and comes in a magnetic case. Shigeru Ban was awarded the Pritzker Prize in 2014, in part due to his pioneering use of cardboard in disaster relief around the world. Other projects by the architect include the Centre Pompidou Metz in France and the Aspen Art Museum in Colorado. Other designers who have into tried their hand at stationery design include Marc Newson, who previously created a fountain pen with a retractable nib for French fashion house Hermès and a set of pens for German brand Montblanc, which feature a magnetic closure system and nibs plated with rare metals.